I never realized how much thought goes in to planning for a baby. But now that I am 12 weeks along, I have become completely obsessed. Instead of staying trapped inside my own head, I decided to do what I have been trained to do, the only thing I know how to do and do well- write about it. Updating friends and family about a pregnancy is a tricky thing. Some days all you want to talk about are crib sheets, onesies and bouncy chairs. Or you are busting to talk about the stuff you are really thinking about, but no one wants to hear about breast pumps, cramps, elastic pants and acne like you're a teenager again. picture frame (whatever is in arms reach) across the room and you really can't explain why you are mad in the first place. If you can't tell by now, I will say point blank that the hormonal roller coaster is taking its toll on me. But every so often, there is a light that peeks through and lets me feel normal for twenty minutes. That moment came yesterday, at my second doctor's appointment. We saw our first sonogram last month, and looking at that collection of black and white specks warmed my heart. But that was four weeks ago. At a stage where I can't feel my baby move and my stomach wasn't really showing, there are days you wonder if you really are pregnant. I was paranoid and all I wanted was confirmation he/she was still in there. Hearing the baby's heartbeat eased that fear. I let out a huge sigh, not of exasperation as usual, but of pure, unadulterated joy. Apparently the baby likes to move around (imagine that- a child of mine who can't sit still.) And just hearing that rapid rhythm will get me through the times where I feel like an alien in my own skin. 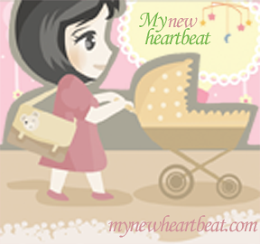 It was my new heartbeat.